Whether you want to find a cosy space where your kids can curl up and read, or the convenience of having books delivered home, or stories and audio books on your tablet, there’s options aplenty to help foster a new generation of bookworms from these lending libraries. First and foremost a storytelling centre run by former journalist Chetana Belegere, Chooku Booku also houses an extensive collection of picture and chapter books. Don’t miss their events themed around stories (think bear hunts, space adventures and tigers coming to tea), which are helpful for reluctant readers. Running for the last ten years, the Discover Kids collection is particularly strong on picture books. You need to drop by to exchange your choices, but books can be renewed via the web. Puzzles, DVDs and games can also be rented. If you’re searching for a particular title, Easy Library’s entire collection is online, and home delivery is also an option. It’s not just kid’s books, so mix and match some choices for yourself, including magazines. 17,000 books over two floors, a carrom board corner, and activities every Saturday morning – plus the promise that it’s not a library for whispering in! Bibliotherapy (recommending books to help children with new life experiences) has been introduced recently, and there’s also an outdoor area complete with mango tree, a fish pond and a sand pit. Ever struggled to pick out the right book? With I-cue’s themed ‘book kits’ which bring together age-appropriate fiction, non-fiction and poetry for kids, you don’t even have to worry about choosing. A bag of five books will be delivered to your door at regular intervals, depending on the plan that you select. Keeping in mind that there are now over thirty city branches, Just Books is literally everyone’s neighbourhood library, and they even provide home delivery. The collection is stronger for middle and teen readers than for picture books and board books, though. What started off as a bookshop recently also became a library. The entire collection has been hand-selected by educators for the zero to nine age group, and there’s a good balance of Indian and international titles. Parents cite the online catalogue and regular sessions on how to encourage a love of reading as the biggest draws. 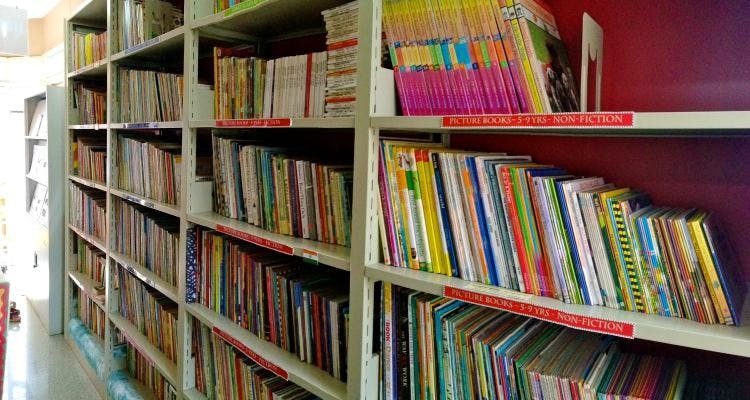 The Marathalli branch of this kid’s furniture brand has a 12,000 book strong library, with everything from board books and picture books to a reference section for school projects and a dedicated foreign language corner. As well as being a soft play and activity centre, KydzAdda has a library of around 1,000 books, with titles for kids up to the age of ten. Visit with tiny tots, as the dedicated toddler section with ‘touch and feel’ books is the highlight. The motto of the MLC Reading Room is ‘we help you raise readers’ – through a collection of books in Hindi and English, as well as via Saturday ‘book club’ events, which library members can attend at a discounted rate. Take the digital route with Story Truck, which is strong on books with an Indian connect, with folk tales, mythology and almost the entire back catalogue of Chennai-based publisher Tulika books. Multiple Indian languages, audio books and bilingual books are available.